Portstewart’s played their last game in Championship Two on Saturday. 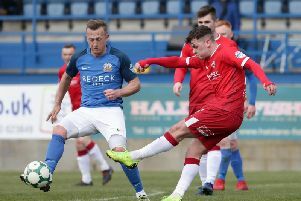 Dundela were the visitors to Seahaven, and they needed to win the tie to ensure a place in the league for next season. The Belfast outfit ran out 3-1 winners, Portstewart goal comiing from defender Paul Milligan late on in the game. Speaking after the game, Ports boss Taylor revealed he is staying on as manager, and added that most of his players would be joining him in the Intermediate League. “We had a good chat with everyone after the game. “The attitude of the players is that we went down together, so we have to come back up together as a team,” he said. Praising his players for their battling attitude, Taylor added: “It’s been a difficult season, my aim was to stay out of the bottom two - and we couldn’t even do that, but the players have stuck together. There’s never been a bad word, players have been going out of their way to get off work for mid week games, and a number have been playing through injury, and I cannot fault that. “The players are down hearted, that’s only natural, you only had to look at them after the match on Saturday, but the rebuilding starts now,” he said. Taylor said that he will meet with the committee later this week to ‘iron out a few issues’ but that he has already been thinking about who he might bring in for next season.